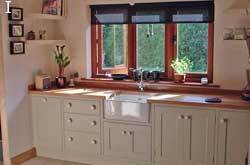 Bespoke hand painted kitchens, designed made and fitted by myself individually for each client. 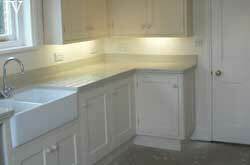 From Butlers sink units and free standing cabinets to complete fitted kitchens. I consider myself to be a “green cabinetmaker” by taking an environmentally friendly approach to my work, using European & Nth American hardwoods along with Pine and Birch Ply, all finished with water based lacquers or water based paints from the varied palette at “Farrow & Ball”. 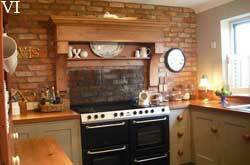 I do not use any Tropical Hardwoods, MDF or Chipboard. Click an image on the right to view more detailed images.